Rinse 1 1/2 cups of your favorite berries( blueberries, raspberries,blackberries). set aside. In another bowl mix 2 cups of all- purpose flour, 3/4 cup of sugar, 2�1/2 teaspoon baking powder, 1/4 teaspoon salt, 1 cup milk, 1/2�cup vegetable oil, and 2 eggs. Mix thoroughly. 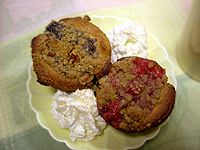 Gently add in the berries and spoon in to 12 muffins cups. Use baking paper cups in the muffin tin. .